PAW PAW, Mich. - Michigan parents have their dog to thank for leaving a trail of paw prints that police used to track a 2-year-old who was missing for several hours. Myhia Perez, Princeton's mother, said she woke up Wednesday to find her son missing from the bedroom and the front door unlocked. Domonic Peake, his father, said he panicked while searching the property surrounded by cornfields, woods and swamps. Peake only found his son's sippy cup. "First thing I thought was he's face down in some water," Peake said. "I thought I was never going to see him again." Perez said discovering that her son had gone missing was terrifying. "I about died," she said. 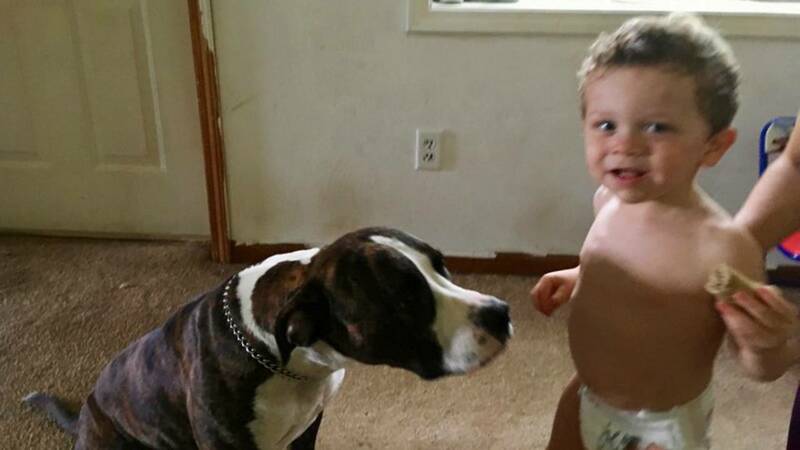 Sheriff Daniel Abbott said the family's pit-boxer mix named Apollo may have saved Princeton's life by staying by his side. Police followed Apollo's tracks to find Princeton in a muddy, wooded area up to a mile away. The toddler was discovered without his diaper, covered in scratches and bug bites. "I owe it to my dog, because if my son was alone who knows what could have happened," Peake said. He said Princeton is healthy and recovering at home. Two shiny new locks adorned the family's front door Friday, out of Princeton's reach.